Optimist International is an international service club organization with 2,900 clubs and almost 87,000 members in more than 35 nations throughout the world. The international headquarters is located in St. Louis, Missouri. Optimist International is also the sponsor of Junior Optimist Octagon International, designed for elementary through high school youth. 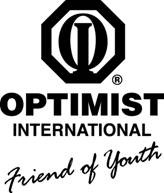 Optimist International's motto is "Friend of Youth" and the organization also uses the branding statement "Bringing Out the Best in Kids." Optimist Clubs demonstrate their caring attitude by carrying out the mission of the organization, "By providing hope and positive vision, Optimists bring out the best in kids."